Are you worried that mom might take another bad fall? Are you concerned that dad is losing too much weight and isn’t eating enough? Has your parent’s house fallen into disrepair? Your concerns about mom or dad living alone are growing, now what? If your family has decided that your parent can no longer live on their own, you will be faced with deciding where to move them. This new world of options—assisted living, retirement housing, home health care, skilled nursing homes, hospice, etc.— brings with it a dictionary of jargon that you may not be familiar with. Let’s start with a single term to define what it is and what it isn’t. This may help your family determine what services and type of care your parent will need. And if not now, this may be helpful information to know for the future. Let’s better define the term: assisted living. 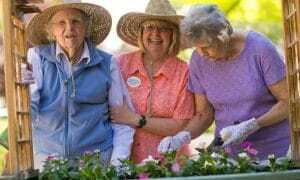 Assisted Living is a long-term care option to assist senior residents with the “activities of daily living” and provides 24/7 care by trained caregivers in a homey, group living environment. The activities of daily living can include dressing, eating, toileting, grooming, bathing, assisting with medication, and transferring. For example, a caregiver can help get your parent up in the morning, dressed, teeth brushed, and hair combed for breakfast in the dining room. An assisted living community includes cooked meals in the main dining room, snacks and beverages throughout the day, housekeeping, laundry, and transportation. Some communities include a salon, barbershop, movie theater, or art/activities room. Assisted living communities are built on a social model with scheduled entertainment and daily activities to keep residents engaged. Most assisted living communities offer private apartments with or without a small kitchenette area. Residents will spend most of their day in the communal areas with their neighbors. Assisted living communities that have designated memory care areas will provide specialized care, modified apartments, and additional security measures with locked doors or delayed egress, motion sensors, and emergency call buttons. Assisted living communities provide care for seniors with a nurse on staff to oversee care plans and staffed with caregivers to administer and track medications, monitor changes in health condition, and assist with daily needs. The caregivers are specially-trained staff, but typically not RN’s. Most assisted living communities bring in specialists on a regular schedule, or residents are able to hire direct as needed: physical therapists, speech therapists, or geriatric psychiatrists, to treat residents within the privacy of their apartment. Often, assisted living is confused with a skilled nursing home. The main difference is in the level of care and pay process. If your parent has a chronic medical condition, permanent disability, or suffers from severe pain, a skilled nursing home can provide round-the-clock nursing staff to medically aid patients with acute care needs. Some would describe an assisted living community as more home-like, and a skilled nursing facility is more hospital-like. Most assisted living community are private pay only while skilled nursing homes may take Medicare if they are Medicare certified, and possibly Medicaid if you have income and assets below certain guidelines. The assisted living communities will complete an assessment on your parent before moving in to ensure the community can meet their medical and physical care needs. If you are wondering if your parent is safe living on their own, whether they are steady on their feet, able to grocery shop and cook healthy meals, capable of getting to a doctor’s appointment or are socially isolated, then an assisted living community may be a good fit for them. Your parent will receive intimate care from 24/7, specially-trained care staff who know how to serve this aging generation safely and with dignity. Visit your local Aegis Living community to learn more about your assisted living care options.